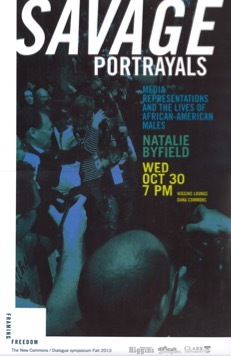 Left: Poster for Higgins Lecture presentation at Clark University, Oct. 2013.
of Black Sociologists (ABS) 2010 annual meeting in Atlanta, GA.
Byfield, Natalie. 2013. "Savage Portrayals: Media Representations and the Lives of African-American Males." Higgins Lecture, Clark University, Worcester, MA. Byfield, Natalie. 2012. “Black Student Service-Learning Researchers: Agents for Change” Paper presented at the Association of Black Sociologists Annual Meeting in Denver, CO.
Byfield, Natalie. 2012. “Narrative Analysis, Blurring the Lines between Quantitative and Qualitative Approaches.” Paper presented at the Eastern Sociological Society Annual Meeting in New York, NY. Byfield, Natalie. 2012. “Using Writing as a Type of Methodology When Teaching Writing in the Disciplines.” Paper presented at the International Writing Across the Curriculum meeting in Savannah, GA.
Byfield, Natalie. 2011. “Talking Your Way into a Legitimate Existence.” Paper presented at the American Sociological Association Annual Meeting in Las Vegas, NV. Byfield, Natalie. 2011. “The More Things Change, the More They Stay the Same: Persistent Foundations in U.S. Racial Discourse.” Paper presented at the Society for the Study of Social Problems Annual Meeting in Las Vegas, NV. Byfield, Natalie. 2011. “The Incorporation of Discursive Techniques in the Search for Justice in a World Marked by Imperialism, Colonialism, and Racism.” Paper presented at the Association of Black Sociologists Annual Meeting in Las Vegas, NV. Byfield, Natalie. 2010. Getting Your Fingers Dirty with Data. Paper presented at the American Sociological Association Annual Meeting in Atlanta, GA.
Byfield, Natalie. 2010. Incorporating Human Rights in the Pedagogy: The Utilization of a ‘Sociology of the Black Experience’ Class to Study Restorative Justice. Presented at the Society for the Study of Social Problems Annual Meeting Atlanta, GA.
Byfield, Natalie. 2010. Voices From Inside: A Study of the Memoirs of Incarcerated Women. Presented at the Association of Black Sociologists Annual Meeting in Atlanta, GA.
Byfield, Natalie. 2010. “Contemporary Gender Dynamics and Family Formations.” Moderated this panel at the Association of Black Sociologists Annual Meeting in Atlanta, GA.
Byfield, Natalie. 2010. “New Language Forms in Computer-Mediated Communication.” Discussant for this panel at the International Sociological Association XVII ISA World Congress of Sociology in Gothenburg, Sweden. Byfield, Natalie. 2010. The Relationship between the Discourse of Restorative Justice and the Carceral System in the US. Paper presented at the International Sociological Association XVII ISA World Congress of Sociology in Gothenburg, Sweden. Byfield, Natalie P. August 2009. “Modern Newspapers and the Formation of White Racial Group Consciousness.” Paper accepted at a Roundtable of the annual meeting of the American Sociological Association. Byfield, Natalie P. September 2008. “At a Loss for Words: The Relationship Between Language & Institutional Structure.” Presented at first Sociological Forum of the International Sociological Association. Barcelona, Spain. Byfield, Natalie P. August 2008. “An Analysis of the Social Construction of Race in the Newspaper Coverage of the Central Park Jogger Story.” Presented at the annual meeting of the Association of Black Sociologists. Boston, MA. Byfield, Natalie P. July 2008. “Positionality as a Sociological Tool: From Alvin Gouldner to Patricia Hill Collins,” Presider’s statement at session I co-organized for the annual meeting of the Society of the Study of Social Problems. Boston, MA. Byfield, Natalie P. April 2008. “Resolving a Critical Methodological Problematic When Studying Race and the Media: A Case Study of an Analysis of the Newspaper Coverage of the Central Park Jogger Story.” Faculty Research Forum, St. John’s University. Feb. 2008. Moderator, Student Roundtable. Annual conference of the Eastern Sociological Society. Nov. 2002. “Models/Tools for the Classroom,” Presenter at conference titled, Gendering the Diaspora: Women, Culture and Historical Change in the Caribbean and the Nigerian Hinterland, Dartmouth College, Hanover New Hampshire. Sept. 2002. “Making it Work: Creating a Collaborative Schools-Business Partnerships that Empower, Enrich, and Educate our Youth,” Keynote Speaker at Eastern Long Island Black Educators Association Luncheon. Feb. 2002. “How the Media Shapes our Understanding of Race,” Presentation to The Hampton Day School Staff at Faculty Development meeting. April 2001 “Race, Gender and the Future of the News,” Keynote Speaker at The College of New Jersey fifth anniversary celebration of “unbound,” the college’s online publication. Nov 1999. “Racial Politics in Media Coverage,” Presentation to East End Unity Meeting at The Hampton Day School.